How do I limit the number of options a user may choose in a list? disable all checkboxes after second choice? wait till after submission to alert? alert in place and double check upon submission? whats the most ideal non invasive way to do it? I have experimented with different solutions for a high traffic website, and the best approach was to use checkboxes and disable the rest of the options when the maximum is reached. Initially the users see regular check boxes. There is a message telling users that they may select up to 2 options, but most of the visitors do not read it. When the user selects two options, we disable the rest. If the user un-checks one of the selected options, all checkboxes are enabled. The approach turned out to be intuitive even for inexperienced users. 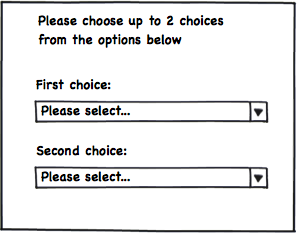 If you don’t have too many options to select from, then you may wish to consider using 2 select options. However, whatever choice has been made in one option will need to be disabled in the other. The downside of this, there is no immediate visibility of the options available. 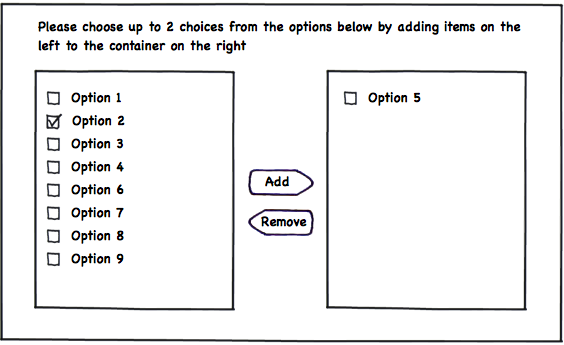 This allows the user to experiment, make choices and refine selection within your constraints. Last of all, the solution that you have eluded to. Once 2 checkboxes have been checked, disable all other options. I would use this option if you have a lot of choices to choose from and the user needs to scan through all of the options and make a choice. If you do have a lot of options like this, consider whether the options can be categorised. If they can, split them up under category headings to improve scan-ability. 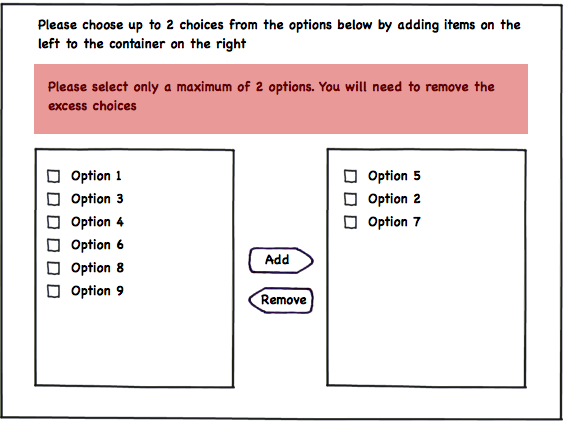 The downside of this, users must deselect an option before they can refine their choice when 2 options have already been selected. To answer your question on “wait until after submission to alert” or “alert in place and double check upon submission” — I think it would be nicer to have inline validation, so once more than 2 choices are made, the user is alerted and made aware that only 2 choices can be made. If we take my last example, and just allow users to select as many as they like, this removes the downside I mentioned which is arguably less frustrating. I would definitely add inline validation if you go with this option. On selecting from one column, you disable the corresponding button(s) for the other (assuming choosing the same option twice is a problem). This prevents a user error from happening in the first place. In your case, two clicks, and the user is done. A simple change takes only one click. It doesn’t take much more space than using checkboxes. A more ambitious alternative is to construct a physical metaphor to communicate the limits. This may be necessary if users are confused by the “1st” and “2nd” (e.g., thinking it implies a ranking that isn’t there). The exact metaphor may depend on the user's domain -you want it to be compatible and ideally communicate why two must be selected. For example, if it's about choosing two objects to "balance" or "oppose" one another, maybe show scales or a teeter-totter to place options on. Tags could be dragged and dropped, but simply selecting a hook moves the tag with focus to the option. Focus starts on a “stored” tag, so that’s three clicks to make two selections… not as efficient as columns of radio buttons, but it scales to higher limits and takes less space. However, that's likely overkill for a max of 2 selections. In that case, I'd suggest going with Michael's suggestion. If you look for a websolution you can take a look at JQuery Multiselect site, where are shown different styles. I like selectList most - you have a standard listbox and all chosen element will be presented as tags below. Visually you could place two gray empty tags, which serves as a placeholder or sort of shadow. Thus users would recognise quickly, that only two selections are possible. I think the selection process for large lists (and limiting those choices) has never been handles very well. The check boxes and the accumulator are okay but neither feels that good a solution long term. And the drop down solution is very limited by the number of the number in the list and whether users understand the list. What about a predefined tag list, so users have a bunch of choices and they can select these moving them across, like the accumulator but more visual. This means the data can be presented in a flater style to stop people just selecting the top things of the list. You can then head up the boxes with some information about their progress. Not the answer you're looking for? Browse other questions tagged checkboxes radio-buttons multi-selection or ask your own question. Why will you choose to use 'Check Box' instead of 'Option List' for two options? Are there standard patterns for vertical radio-button like choices in tables? What is the best way to gather optional data using radio button groups and drop-downs?